An Enchanted Wedding at the Four Seasons Hotel – Dayna + Todd! It was an enchanted evening at the Chicago Four Seasons for Dayna + Todd’s wedding ceremony + reception! Wonderfully pulled together by Jan from Parties, Events & More! Before going into the details- here are a few of my favorites from their wedding day! Such luxury at the Chicago Four Seasons…even their wall paper! HMR Designs transformed the Four Seasons ballroom into this beautiful enchanted forest! Wedding Coordinator: Jan Ehrenberg from Parties, Events & More! The moment she walked in the room- all her bridesmaids rushed to get their phones! This photo in black and white almost could be an ad in a magazine! Last moment with her parents before heading down for portraits with her groom- what a special moment caught in a photograph! After their first look- we walked around the Four Seasons for some photos with just the two of them! I love how romantic this photo feels! 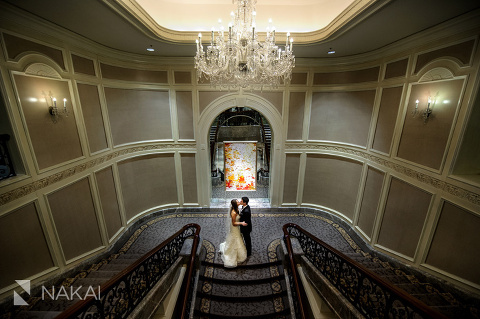 Love the strong leading lines of the Four Seasons staircase- leads you right to the bride and groom! They braved to cold to grab a few shots outside! Walking downtown with the John Hancock in the background! Had to take a few photos on Michigan Avenue! Dayna had a great idea to wear her bridal Nike high tops shoes outside! Comfortable to walk in and keeps her toes warm! While we waited for the bridal party to arrive…Dayna grabbed one of their selfie sticks for a quick group photo! My second photographer was able to capture this beautiful photo! HMR Designs put together a beautiful reception room! Custom favors made by Mrs Stoller Chocolates! Their wedding cake presented on a vintage chair! They walked in and had their first dance surrounded by their friends and family! Dayna singing on the dance floor with The Gold Coast All Stars band! The bride and groom joined the Gold Coast All Stars on stage for a number! I absolutely LOVED this LED lit frame dessert table by HMR Designs! It was incredible! The details on the desserts- great job by Mrs. Stoller Chocolates! We had to get a ring shot on these custom painted leaves! Thanks Dayna + Todd for having me as your wedding photographer! You put together an amazing team of wedding vendors to bring your luxury wedding dream to fruition! There were so many amazing pictures from your wedding day- it was hard to narrow down for the blog post! Hope these photos captured the energy & joy from your special day! HoteluriI savor, cause I discovered exactly what I used to be looking for. 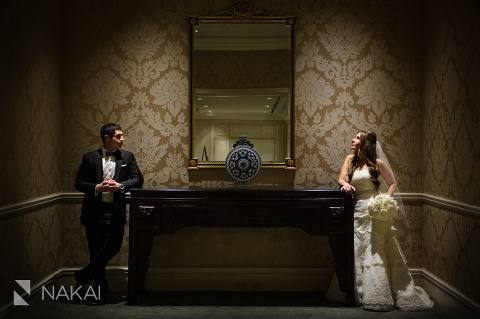 « A Beautiful Wedding at the Trump Hotel – Rachel + Paul!